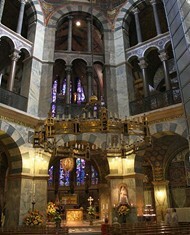 History of Illuminations, Architecture under Charlemagne At Aachen. The main achievements of medieval art under Charlemagne, Louis the Pious, Lothar I and II and Charles the Bald, included church architecture, religious mural paintings, and iluminated gospel manuscripts, such as the Lorsch Gospels, the Utrecht Psalter, the Ebbo Gospels and the Godescalc Evangelistary. For other periods, see: Art Movements, Periods, Schools. When Charlemagne (742-814) was raised to the exalted rank of Holy Roman Emperor by Pope Leo III on Christmas Day of the year 800 in the old Saint Peter's Basilica, Rome, he gave his name to a period and laid the foundation of a dynasty that was to rule Western Europe for 100 years. Charlemagne (Charles the Great) had been crowned King of the Franks jointly with his younger brother Carloman in 768. In 771 Carloman died and left only one possible infant successor. The Franks therefore wisely accepted Charlemagne as their sole ruler - a position of power that enabled him to build partly by conquest, partly by diplomacy, partly by creating a new form of centralized bureaucratic and fiscal control, a new Western Empire, the largest since Antiquity. At his death in 814, Charlemagne's Empire extended to southern Italy, the River Ebro in Spain, and eastwards as far as the River Elbe in the north and the Hungarian plain in the south. see the Book of Kells (c.800). Meanwhile the Imperial coronation offered benefits to both Pope Leo and to Charlemagne. The pope gained the emperor's protection for himself and the Church; while Charlemagne - according to the learned scholar Einhard - fulfilled one of his dearest wishes: the wish to re-establish the ancient authority of the city of Rome under his care and by his influence. This would be no mean feat, for when he became king of the Franks in 768, Rome had very few possessions - the vast lands it once ruled were fought over by a host of different rulers and cultures. Even in Italy the Pope was far from safe. The reign of Charlemagne reversed this situation. He extended his territory from Italy to the North Sea and from the Elbe River to the English Channel; he also sought to unite the population under Christianity - emphasizing the unity of church and state - and promoted a revival of Christian art known to historians as the Carolingian Renaissance, after Carolus, the Latin for Charles. Political and military activity dominated the early decades of Charlemagne's long reign, but by the 780s the first evidence of his cultural revolution can be discerned; it was to increase in scope and magnitude in the last 20 years of his life. It may well be that the enormous treasure of the Avars (it is said to have taken 15 carts, each drawn by four oxen, to carry only the gold and silver and precious garments), captured in 795, played an important part in providing the necessary surplus wealth to pay for Charlemagne's lavish patronage of early Christian art and culture. Clearly the basic intention of this patronage was to create a new image for a "barbarian" ruler - an image to rival the great past, the Roman Empire. Court poets were to call Aachen, Charlemagne's favourite palace and the major centre of the Empire, the "New Rome", a name applied hitherto only to Constantinople. The most obvious symbol of this New Rome was the palace itself. A court scholar described Charles supervising its layout from a high vantage point, pointing to where the "forum", the "senate", the "theater", the "baths", the "Lateran", and even the "aqueduct" were to be built. The palace chapel itself, planned on a central octagon and under construction by 786, was not only based in its design on S. Vitale, built by the Byzantine Emperor Justinian in the 6th century in Ravenna, but Charlemagne actually ordered columns and carved capitals to be imported for it from there. (See also: Ravenna Mosaics.) Bronze doors with lion-head handles and finely chiseled Classical moldings, bronze railings with Classical pilasters, Corinthian capitals, and entablatures decorated with acanthus-scrolls, again emphasize the debt to Antiquity. Molds for the doors, excavated at Aachen in 1911, prove that this technically highly competent casting was undertaken on the spot. In 801 Charles brought the life-size equestrian bronze-gilt statue of what was believed to be the first "Germanic" Emperor Theodoric (it was probably the late-5th-century Emperor Zeno) from Ravenna, and set it up between the palace chapel and the palace. The statue itself perished later, but a miniature equestrian bronze now in the Louvre, Paris, probably a representation of Charlemagne himself, was no doubt inspired by it. That statue and the large bronze pinecone, intended to be set up as a fountain in the atrium in front of the chapel, in direct imitation of a similar fountain in front of St Peter's Rome, prove how self-conscious this revival, or Renovatio as it was called at the time, of Classical Antiquity was at the court. As well as architecture, some figurative and decorative sculpture survives from the period. Outstanding among it is work in stucco, like the life-size figure of Charlemagne in the church of St John, Mustair, and the decoration of the church of S. Maria in Valle at Cividale, the capital of the first Duchy of Lombardy in Italy. The Mustair figure is identified as Charlemagne by a late medieval inscription; although its date is controversial, it is likely to have been made during the period from 806 to 881 when the monastery was an Imperial possession. The stucco decoration at Cividale is of an elaborate kind. It includes a superb arch made of pierced vine-scrolls and six life-size female figures, and is combined with wallpainting. The work probably dates from just before Charlemagne's conquest of Lombardy in 774, and may well have been derived from eastern Mediterranean sources; it is posssibly even the work of imported Syrian craftsmen, whose work at Khirbat-al-Mafjar, a private mansion in the Jordan Valley built between 724 and 743, shows a similar decorative vocabulary, though no large-scale figure-work. The technically far less skilled work of the figures at Cividale, when compared to the decoration, might seem to strengthen the argument that craftsmen, not practiced in this part of the work, were imported. Such fine remains in a somewhat fugitive medium suggest that this kind of medieval sculpture was probably far more common in the Carolingian era than the few survivals indicate. Sculpture in stone, apart from architectural details, seems to have been restricted to church furnishings, like choir enclosures, as seen in St Peter, Metz, S. Benedetto, Malles, and Schanis, Switzerland. In quality, the surviving carved slabs of such enclosures are far less sophisticated than the Cividale stuccos and are more likely to belong to a long established pre-Carolingian tradition. Both the occasional insular influence and the uncertainty scholars have to admit about whether panels such as those of St Peter's, Metz, should be dated to the early 7th or the late 8th century, emphasize this continuity. The recently discovered fragments of a screen from a church founded in 783 at Cheminot, attributed to the same workshop as those at Metz, lend strong support to a Carolingian date for much of this work. (See the contemporary Celtic High Cross Sculptures, being produced in Ireland). Note: Carolingian style plastic art paved the way for the Europeanwide style of Romanesque Sculpture (c.1000-1200). In ivory-carving, a kind of miniature art which comprised a significant proportion of early Christian sculpture, such a sense of continuity with earlier traditions cannot be found. Here, models of the Antique, ranging in date from the late 4th to the 6th century, were closely imitated. The ivory bookcovers for Court School manuscripts, like the great covers of the Lorsch Gospels (now divided between the Vatican Library, Rome, and the Victoria and Albert Museum, London) based on the 6th-century style of Byzantine art patronized by Justinian's Archbishop Maximian at Ravenna and on the style of the consular diptych so fashionable in the 5th and 6th centuries, show this intention clearly. Occasionally, as in the bookcover of the Bodleian Library manuscript Douce 176 in Oxford, the exact 5th century models, showing identical iconography and closely related styles, actually survive. As far as illuminated manuscripts were concerned, two very distinct styles were developed at the court. The first, not only again based on late antique models, but actually enshrining the loosely handled painting style of the late Antique, is best represented by the superb Coronation Gospels, painted on Imperial purple stained vellum now preserved in Vienna (Weltliche und Geistliche Schatzkammer). Here we cannot speak of a revival of a Classical model, but must assume that the painter was actuually trained in the antique tradition itself; perhaps the name of the priest, "Demetrius", mysteriously written in gold into the margin at the beginning of the Gospel of St Luke, gives us a clue, pointing to Byzantium itself where such a living tradition is more likely to have survived into the late 8th century. The book itself is said by tradition to have been found on Charlemagne's knees when his tomb was opened at Aachen by the Emperor Otto III in the year 1000; it was used thereafter at German Imperial coronations. Perhaps more creative than the astonishing and almost academic conservatism of the book illustration of the Coronation Gospels is a group of major gospel books made for the Imperial chapel at Aachen, now known as the Court School though called the Ada School in earlier literature. The earliest manuscript in this group, the Godescalc Pericopes in Paris (Bibliotheque Nationale), dated 781-3 and made as a gift for Pope Hadrian I, gives us a clear indication of the kind of sources available at the court at the beginning of the School's existence. The figurative elements tend to be derived from provincial Byzantine sources, probably transmitted mainly through northern Italy, while the decorative vocabulary, especially in the elaborate opening folios of text, is enriched by British (Insular) influence. This may in part be a traditional and long-established element in the Frankish Kingdom, and in part the result of a renewed contact with English artistic traditions through such eminent scholars as Alcuin, who was summoned from York to the court by Charlemagne in 781. A similar fusion of Insular and Byzantine styles can be found in the ivory bookcovers from Genoels-Elderen (Musees Royaux d'Art et d'Histoire, Brussels) probably contemporary with the Godescalc Codex. The mature Court School style, developed first in the Abbeville Gospels (Bibliotheque Municipale, Abbeville) and then in the Trier Gospels (Stadtbibliothek, Trier) and the Lorsch Gospels (Vatican Library, Rome) is more linear than painterly, and in its technique finally establishes the medieval method of laying in a middle tone and working both light and dark variation on it, ending in white or gold highlights, each applied when the previous stage of the work has dried. (See also: Making of Illuminated Manuscripts.) The artistic antecedents of this style are found in the 6th-century "Byzantine antique" of Justinian's art of Ravenna, also found in the magnificent Lorsch ivory bookcovers on the one hand (Victoria and Albert Museum, London), and in north Italian painting, exemplified both by wall-painting as at Cividale and by the unique survivval of a high-quality north Italian manuscript, the Egino Codex (Staatsbibliothek, Berlin) produced at Verona between 796 and 799, on the other. Although little Carolingian walling survives north of the Alps, there can be little doubt that it was not only inspired but may even have been executed by Italians. For more, see also: History of Illuminated Manuscripts. In Italy, a much fuller picture can be gained of the importance of wall-painting as a form of architectural decoration in the Carolingian period. Here, both the earlier traditions and their continuation into the 9th century are fully documented by the survival of examples spanning the centuries from the beginnings of Christian fresco painting in the Catacombs of Rome to the Carolingian era. In the church of S. Clemente in Rome, a series of frescoes which includes the Ascension, the Harrowing of Hell, and a Madonna, are found in the early basilica below the later church, and can be dated by the votive portrait of Pope Leo IV (847-55) included in the scheme. Here, the earlier painterly illusionism of the Classical tradition is transformed into a harder and more linear idiom which already foreshadows the Romanesque art of the 11th and 12th centuries. So what appears at first sight to be painting of rather limited and indeed almost crude quality may be, in a very real sense, progressive. The decoration recently uncovered and studied at S. Salvatore in Brescia includes both wall-painting and fine stucco work. It is found in the monastic church founded in the 8th century and rebuilt in the time of Louis the Pious. Stylistically, the painting here is in much closer touch with older Italian painterly traditions, which serve far better as models for the kind of wall-painting known in the Alpine area and north of the Alps. At Malles, in the Italian Tyrol, and at Mustair in Switzerland, painting strongly influenced by such Italian sources survives; and at Mustair the style is so close to the Brescian model that the work may well be by painters trained there. In the church of St John, Mustair, the largest cycle to survive outside Italy is very important both for its iconography, as well as for its style. No less than 62 scenes from the New Testament decorate its walls, unusual in the period when Old Testament scenes are found far more commonly in Carolingian manuscripts. Mustair serves as a useful reminder that only a small proportion of the work executed has survived. Documentary evidence also shows clearly how common painted decoration was in the 9th century, and how important Italian artists were to the North. It is known, for example, that the original decoration of the palace chapel at Aachen itself was undertaken by Italians called specially for the task. The rare survival of mosaic art north of the Alps at Germigny-des-Pres, finished c.806, was no doubt also inspired by Italian work and almost certainly executed by such travelling craftsmen. More difficult to establish than the Renovatio at the court is the continuation of older traditions, both Merovingian and insular, in the rest of Charlemagne's Empire, away from the scholarly atmosphere at the court. Some evidence, however, suggests that it must have existed. One example may well be the richly decorated purse reliquary from Enger (Staatliche Museen, West Berlin) traditionally said to have been given to Count Widukind of Saxony by Charlemagne on the occasion of his baptism in 785, but more likely to have been given by the Count to Enger at its foundation in or soon after 807. The later date is suggested by the reverse of the reliquary, where the iconography appears to be influenced by the Lorsch ivory covers produced at the court in the early 9th century. Another example of the continuing importance of insular influence is the back bookcover of the Lindau Gospels (Pierpont Morgan Library, New York) which, because it contains elements of the Scandinavian "gripping beasts" style, is likely to date from no earlier than the early 9th century. In architecture, too, where continuing traditions of craftsmanship and knowledge of construction techniques are even more likely to be of great importance, no matter what the immediate sources or the intentions of patrons, there is some evidence that the 8th-century Frankish background, badly documented though it is, was a significant factor alongside new ambitions. The structure, for example, as distinct from the design of the Aachen palace chapel, does not relate at all to its Ravenna model, and the exterior decorative treatment of the earlY-9th-century Lorsch Abbey gateway has alongside its purely Classical half-columns, pilasters, Corinthian capitals, and elaborate cornice, a traditional triangular arcade on the upper level and a decorative mosaic treatment of wall surface - clearly a Merovingian technique found in the crypt of Jouarre Abbey, near Paris, and dating from the 7th century. Although it is more difficult to sketch a consistent development for Carolingian architecture than for the figurative arts, the lasting contributions made in the 9th century to early Romanesque architecture are obvious and outstanding. The elaborate plan drawn for Abbot Gozbert of St-Gall, who began rebuilding his abbey in 830, was probably drawn by Heito, Bishop of Basel and Abbot of Reichenau from 803 to 823. It shows a large abbey church with both eastern and western choirs, cloisters, and a vast variety of abbey buildings, from the abbot's lodgings, infirmary, and guest houses, to kitchens, barns, and even chicken coops. It lays down a kind of "ideal monastery" that was to remain a model throughout the Middle Ages. Although monastic life had been vigorous and constantly expanding in Europe since the 6th century, the kind of sophisticated physical organization we see reflected in this plan is a new contribuution much influenced by the monastic reforms introduced by Louis the Pious' tutor Benedict of Aniane. Also of great importance was the development of the crypt as an important part of major churches. Although the surviving examples seem to have some basic characteristics in common, their precise forms are by no means closely related. This is typical of a period in which uniform customs and functions were being established, but architectural solutions accepted by tradition were not yet available. The reason for the appearance of crypts was the growing popularity of the worship of saints and their mortal remains. Almost like a second church, a smaller, more intimate space was created at the east end of the church, often on the same level as the nave, covered by groined and barrel vaulting of very limited span to carry a raised eastern sanctuary reached by steps up from the nave. At the church of St-Germain, Auxerre, a large crypt was built between 841 and 865 which has quite a large central chamber surrounded by a three-sided ambulatory walk and another chamber to the east. This probably led originally to a circular oratory beyond. At St-Medard, Soissons, erected between 826 and 841, a series of seven small barrel-vaulted chambers cross the whole width of the church, linked by a narrow groin-vaulted walk running north to south, with yet another three tunnel-like extensions running towards the west. We are reminded, in such an array of small funerary chambers, of the catacombs of Rome. Such crypts, in all their variety of forms, had one added advantage in common: in the raised sanctuary of the upper church, the high altar stood immediately above the most holy relics of the saints below, while at the same time a more intimate contact with such relics was possible in the crypt itself. As well as developing new architectural forms at the east end of churches, Carolingian architects also paid new attention to the west end of their major buildings. Here great masssive structures were built, always at least two stories high, usually square or rectangular in plan and normally surmounted by one central or two lateral towers. These structures have been given the name Westwerk. One of the finest to survive is at the abbey church of Corvey in Westphalia, built 873-85. At the entrance level there is an open hall, where 16 supports carry a groined vault surrounded by a narrow aisle on all four sides. Above this, no doubt on the level of the tribune galleries of the original church, is a spacious chamber reaching through two stories in height; its windows with double openings look into it from the surrounding walks on the upper level. The function for which these enormous western structures were built has never been established beyond doubt, although it is clear that baptisms took place in some, while others were used as a kind of Royal or Imperial tribune gallery, looking from an upper level into the nave of the church and towards the high altar. Altars in the Westwerk were often dedicated to the warrior saint St Michael: so were these structures simply, or even mainly, the defence against the powers of darkness coming from the west? Much clearer than their original purpose is the fact that in its monumental emphasis on the west end of the "Great Church", the Westwerk is the ancestor of the two-tower facade which was to become the conceptual hallmark of many churches. After the death of Charlemagne in 814, the idea of the Renaissance of Antiquity certainly persisted and was even heightened during the reign of his son, Louis the Pious. 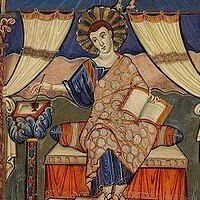 Whereas the Court School in its ostentation reflects the taste of Charlemagne, the more scholarly academic style seen in the Coronation Gospels may have been patronized by Louis, crowned King in 781 and co-Emperor in 813. Certainly, while the Court School ceases with Charlemagne's death, the influence of the Coronation Gospels and similar precise classical revivals gains ground after 814. Outstanding works of art like the Utrecht Psalter (University Library, Utrecht) and more particularly the Ebbo Gospels (Bibliotheque Municipale, Epernay) written for Archbishop Ebbo of Reims (elected 810, deposed 845) descend directly from the Vienna Gospels. But whereas the latter retains the calm, restrained grandeur of the late Classical style, the Ebbo Gospels are painted with a violent fervor of expressionistic intensity. The painterly impressionistic touches of strong, clear colour are identical in both, but in the Ebbo Codex this technique is combined with a more linear use of paint and far more contrast in light and dark, heightened in the final touches with black lines and gold highlights. It is in this linear treament that the style developed in the Utrecht Psalter is seen most clearly, where illustrations are drawn throughout in brown ink. Each Psalm is illustrated by unframed compositions, each occupying about one third of a page. Closely bunched groups of figures enact a kind of literal translation of the narrative content of the text in pictorial form. Landscape and architectural details are drawn with the same rapid line and delicate illusionism, and all parts of the drawings are swept along in ecstatic movement. Because of the book's connection with the Archbishop of Reims, it is known as the Reims style; it was to be one of the most influential contributions to medieval art. In a way, the continuing interest in the art of the late Antique during the reign of Louis the Pious is shown even more clearly in an ivory panel now in the Merseyside County Museum, Liverpool. It shows the Crucifixion with the Virgin, St John, and Stephaton and Longinus above, and the three Maries at the Tomb below. 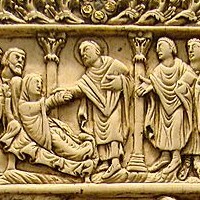 The latter scene is an exact imitation of an earlY-5th-century ivory now in the Bayerisches Nationalmuseum, Munich. After the death of Louis the Pious in 840, the Empire was divided into three parts by the Treaty of Verdun in 843. The central area of Europe, from Lower Lorraine in the north to Italy in the south, and the Imperial title, were given to Louis' eldest son Lothar I; the eastern regions went to Louis the German, and the western area, mainly ancient Gaul, was received by Charles the Bald, Louis' youngest son by his second wife, Judith. This division lasted until the Treaty of Meersen in 870, when on the death of Lothar II (second son of Lothar I), Louis the German and Charles the Bald divided the central Kingdom between them, leaving only Italy to the descendants of Lothar I; the boundary was drawn more or less along the line between modern Germany and France. (See also German Medieval Art.) As a direct result of such divisions, the centralized patronage of Charlemagne and Louis ceased. Under new rulers and powerful churchmen, new centres of activity developed: Tours, Corbie, St-Amand, and St-Denis in the west; Corvey, St-Gall, and Fulda in the east, and Metz and Milan in the central kingdom. The great abbey of Tours first established a tradition of scholarship under Alcuin in the late 8th century. It then developed important artistic production under the patronage of its Abbots Adelhard (834-43) and Count Vivian (843-51), a production which flourished until the destruction of the Abbey by invading Norsemen in 853. The Old Testament illustrations created there, probably based on 6th-century Mediterranean models, were to lay a foundation in both iconography and style which was to be vividly exploited at Hildesheim as late as the 11th century. In the large Tours Bibles, the whole-page illuminations are either single subjects, like the Christ in Majesty at the beginnning of the Gospels and the dedication pictures, or they are organized in three or four strips across a page in continuous narrative form - almost like a strip cartoon. The obvious source for this is the tradition of the antique scroll, seen in sculptural form winding up Trajan's Column in Rome. The same tradition is also seen in the horizontal strips of colour in the background of the Old Testament scenes, a somewhat misunderstood adaptation of the graduated colour background of late antique painting intended to simulate the aerial perspective of the original. One of the great Tours Bibles, the Vivian Bible (Bibliotheque Nationale, Paris: MS. lat. I), ordered by Count Vivian in 845 and dedicated to Charles the Bald, links the Tours style with the last great Carolingian school to have been created, that of Charles the Bald. The last phase of ivory carving at Metz, long known as the Younger Metz School, begins with a Crucifixion plaque mounted on the cover of a manuscript dated to c.840, now in the Bibliotheque Nationale, Paris, (MS. Lat. 9383) where it is surrounded by a magnificent border of precious metalwork including gems and gold cloisonné enamelling closely related to those found on the Golden Altar of S. Ambrogio in Milan of c.850. A large number of related Crucifixion panels survive, as well as plaques with scenes from the New Testament made as back covers for the same books. They must date from the period of high activity at Metz which ceased when Metz declined as an artistic centre after the Treaty of Meersen in 870 - a decline also reflected in the fact that the production of illuminated manuscripts virtually ceases in Metz at that time. It was especially at Metz and Milan that the characteristics of the earlier Renovatio were further developed. Drogo, Archhbishop of Metz, half-brother of Louis and Chaplain to the Emperor Lothar I, based his patronage on the traditions of the court, while at Milan, works like the great Golden Altar frontal of S. Ambrogio (c.850) enjoyed the advantages of having fine Early Christian models close at hand. The development of Metz as an artistic centre is a long and complicated story. After Drogo was appointed to the see in 823, close relations with the court of Louis the Pious were established and maintained throughout its subsequent history. After the accession of Lothar I and Drogo's elevation to Archbishop in 844, relations with the court were probably even closer. From the beginning, the painterly late antique "Court" style of Louis was of greatest importance. Also, Classical influence was not only stylistic - the earliest known manuscript, probably written for Metz in the early 820s, was an astronomical compilation, now in Madrid (National Library; Cod. 3307). The vast majority of Classical texts, literary and scientific, survived into later periods only through the enlightened activity of Carolingian scholars and scribes. Drogo's own sacramentary (Bibliotheque Nationale, Paris) not only continued this painterly late antique style, but also established a decorative vocabulary based mainly on Antiquity's favourite acanthus ornament, and developed the art of the initial filled with figure scenes to illustrate the text ("historiated" initials), which was to become one of the great artistic conntributions of medieval illumination. The ivory bookcovers of this same manuscript, of better quality than reproductions of it suggest, survive only in fragmentary form. They show scenes from the liturgy, which, although it is an unusual series of subjects - indeed, unique among bookcovers - are highly suitable decorations for a personal sacramentary. Stylistically, these covers can be related to another now in Frankfurt (Stadtbibliothek; MS. Barth. 180) where a large central panel showing Christ's Temptation indicates that the Metz school had an astonishing mastery of the classical style in the 840s. A number of other carvings with the same strong element of classicism must be the work of the same school, such as the covers of a gospel book now in Munich (Bayerische Staatsbibbliothek) with the Baptism of Christ on the front, and the Annunciation and the Nativity on the back, attributed by some scholars to the l0th century. One of the centres in which the Court school of Charles the Bald was probably active was the royal abbey of St-Denis, of which Charles became lay abbot in 867. A great wealth of manuscript illumination and goldsmith's work was commissioned, especially in the last decade of his long reign ending in 877; perhaps the decline of Metz after the death of Lothar II in 869 enabled Charles to add a rich stream of artistic talent to the established traditions active in his kingdom. In many ways, technically and stylistically, a manuscript like the Codex Aureus (Bayerische Staatsbibliothek, Munich), written by Beringar and Luithard in 870, and its magnificent golden bookcover, sum up all the achievements of Carolingian art. Whereas earlier in the century, schools like Metz or Aachen could for the most part only exploit the heritage of Antiquity, the artists employed by Charles were able to enrich that heritage by transforming it into a wholly Carolingian idiom, at the same time as summing up all that had been achieved before. Charles the Bald might even have been aware of this, when, in a charter granted in 877 to his favourite foundation at Compiegne, he states specifically that he wished to follow the example of Charlemagne in presenting a large number of relics to his new church as his illustrious granddfather had done at Aachen. Certainly, the enormously rich style of decoration evolved in the Codex Aureus and its related manuscripts rivals and even surpasses the work at Charlemagne's Court School in richness and ostentation. In goldsmith's work like the Codex Aureus cover, the late Lindau bookcover (Pierpont Morgan Library, New York;) or the golden altar frontal for his Royal Abbey of St Denis (now only known from a painting by the Master of the Mass of St Giles, of c.1500; National Gallery, London) the same splendour is found and the same technical and stylistic summing up of all previous achievement. The iconography of the Codex Aureus cover, as well as its Christ in Majesty page, is based closely on the Tours tradition found in the Vivian Bible. The painterly and vivid expression of Charles' personal Psalter of c.860 (Bibliotheque Nationale, Paris) owes much to the Metz school, and the goldsmithing techniques employed at the court draw fully on all previous work - especially the more sophisticated traditions of northern Italy seen so clearly in the Milan Golden Altar. Only in ivory-carving does the same wealth of material not seem to be available. Recent research has shown, however, that the great "Throne of St Peter" in the Vatican was made for Charles the Bald; but here, as elsewhere in this period, ivory panels seem to have been turned and carved a second time, and more often than is usual. Also ivories very closely connected with the style of the Utrecht Psalter, and perhaps carved nearer 830 than 870, were used, perhaps reused, by Charles' craftsmen. Perhaps the trade in the raw material of ivory tusks was declining in the second half of the 9th century. Also, the great variety of styles patronized by Charles is obvious; alongside those already mentioned there is still the Franco-Saxon style of the so-called "Second Bible" of Charles the Bald (Bibliotheque Nationale, Paris), a decorative art of great elegance and precision derived from earlier Insular sources. It would be wrong to call this great variety of work the "School of Charles the Bald"; it is the work of an era rather than of a school, but more truly creative and more truly Carolingian than any that had gone before. None of the successors of Charles the Bald in the last quarter of the 9th century was able to create sufficient stability to encourage the arts at their courts. The Carolingian achievement as a whole was of the greatest importance to the civilization of northern Europe. The long established predominance of the Mediterranean tradition was finally broken, not by any fundamentally opposed aesthetic but more by the absorption of its humanist tradition. Throughout the Middle Ages, from the 9th century onwards, whatever influence the Classical tradition was to have on the art of the west, be it in its antique, its Early Christian, or in its Byzantine guise, it has always to be qualified by what might be called an indigenous northern classicism created by Carolingian artists. See for instance the influence of Carolingian traditions on the Romanesque school of Mosan art, led by goldsmiths like Nicholas of Verdun (c.11561232) and Godefroid de Claire (c.1100-73), which grew up around the Bishopric of Liege.  For more about the origins & development of the fine arts, see: Homepage.